The Riviera Maya in Mexico is known for the best cenotes, cavern, and cave diving in the world so no matter what, you don’t want to miss an opportunity for unique scuba diving in Tulum! 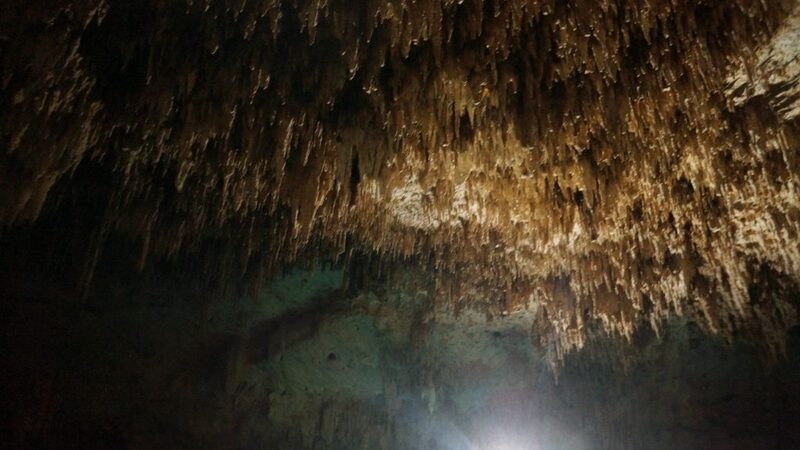 An experience of a lifetime that takes you through pristine, blue waters underground to admire stalagmites, stalagmites, and columns and explore what the Mayan’s believed was the entrance to the underworld. Having dived all over the world I was apprehensive to say the least about the quality of diving I would get in the touristy town of Tulum and at the Tulum Cenotes, but as soon as I saw first cenote (seh-NOH-tay) all my suspicions washed away as my experienced guide Joe from MexiDivers introduced me to these wonders of the world. In Mexico’s Yucatan Peninsula there are over 6,000 cenotes (naturally occurring sinkholes) scattered around, usually connected to a network of underground rivers – and Tulum Cenotes are all connected to three of the largest underground river systems, the Dos Ojos system, Sac Actun system, and the Ox Bel Ha. These underground rivers are formed over eons as rainwater – which is very so slightly acidic – slowly dissolves the Yucutan’s characteristic limestone bedrock on its course for the ocean. So instead of atypical above-ground rivers (there are zero rivers in the Yucatan!) here you end up with huge river systems hidden within the calcareous landscape until the limestone roof of the river collapses from the weight above and a cenote allows access to this pristine, clear water…or to the Mayan underworld! In ancient Mayan culture, cenotes were considered the entrance to their underworld Xibalba, roughly translated as ‘place of fear’. In other mythologies, the Maya rain god Chaak was thought to reside in cenotes, and even today Maya farmers in the Yucatán dry season still appeal to Chaak for rain. In the past cenotes were a place of ritual to invite rain and so, alongside dinosaur and human remains, cave divers here have discovered many ancient treasures from Maya times within the cenotes system – So keep your eye out for anything shiny while Tulum cenote diving! There is even evidence human sacrifices were made at cenotes, and although there is significant debate as to whether this actually occurred in pure Mayan society it is known to have occurred on a large scale at Chichen Itza’s sacred cenote thanks to a mixing of cultures over time. Tulum on Mexico’s Maya Riveria is world’s premier destination for cenote and cavern diving because of it’s close proximity to the world’s three largest underwater cave systems – The Dos Ojos system (56 km), Sac Actun system (61 km) and the Ox Bel Ha (129 km), all of which are still being explored! 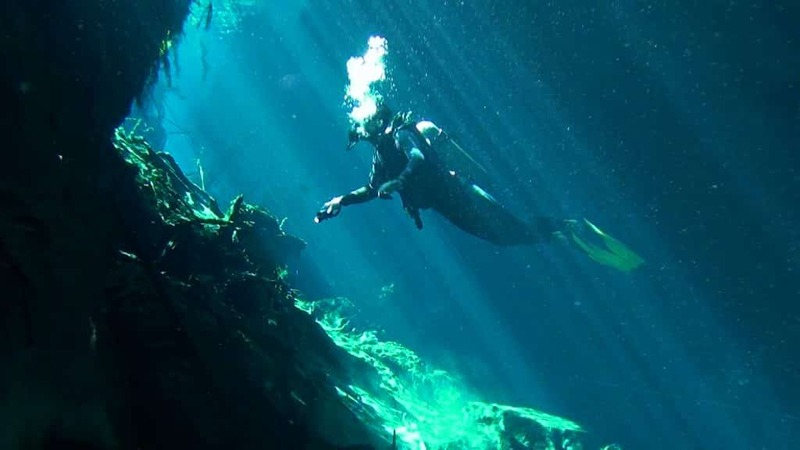 Although there are many, many cenotes surrounding Tulum relatively few provide all the necessary requirements for recreational cavern diving to go ahead safely. Obviously, cavern diving is not like diving in the open ocean, the principles are slightly different – but if you listen and follow all instructions from a good, safe dive guide you will have nothing to worry about! Always stay within the limits of natural light penetration in the cavern. Do not venture further than 60 meters or 200 feet from the nearest cavern opening. Only go with a certified dive master/cave diving expert who is familiar with the site. Follow all guidelines (temporary or permanent) given to you by your guide. One flashlight per diver is a minimum. Have no more than 4 divers per guide. Do not pass a maximum depth of 21 meters. Always follow, but do not touch, the guide rope. A cavern is defined as an area of a cave with natural daylight and found at a maximum depth of 60m from the surface. 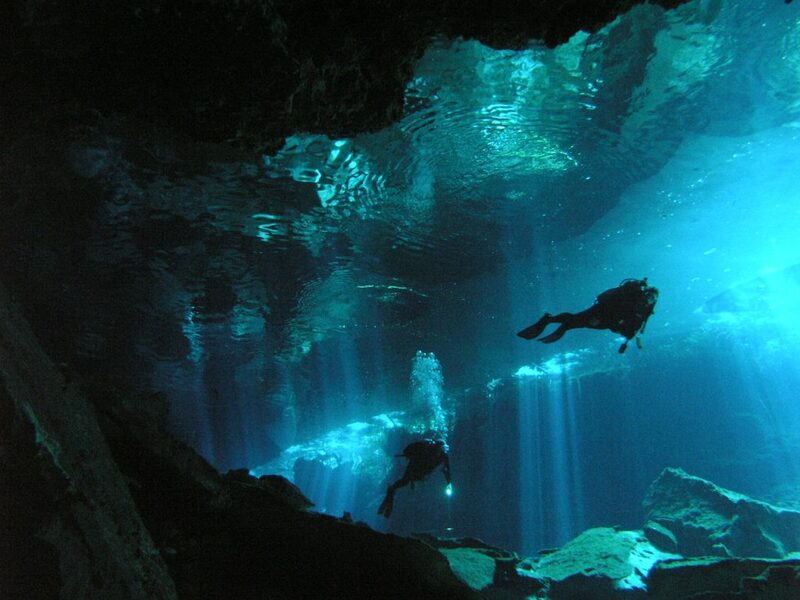 Dos Ojos Cenote – Easily one of the world’s best cavern dives. Dos Ojos means two eyes and refers to the two major cenotes here interconnected by a very large cavern you can explore. Expect insane clarity, many stalagmites, stalactites and columns and a mid-dive visit to the bat cave! A shallow dive with plenty of room, perfect for beginner scuba divers and snorkelers alike. Tajma Ha Cenote – A quiet cavern not often frequented by dive groups because of its up-and-down profile but offers all the hallmarks of cenote diving include fossils, a sharp halocline, collapses and limestone halls. A very enjoyable dive not recommended for beginners or those with sensitive ears. Temple of Doom Cenote – Three holes of the roof here give you the feeling of being in a skull, and complete with a unique halocline make this a very popular five. Every tree branches can be seen here, and well as a weird green light at the entrance of the cave… Just don’t go too far unless you want to find out how right the Mayan’s were. Garden of Eden Cenote – If you really are a marine life lover this one is going to be for you! A pond full of aquatic creatures, including the occasional turtle, you can also get that much-desired halocline and associated light effects here. There is also an unusual temperature variation in this cenote attributed to the mixing of salt and fresh water. 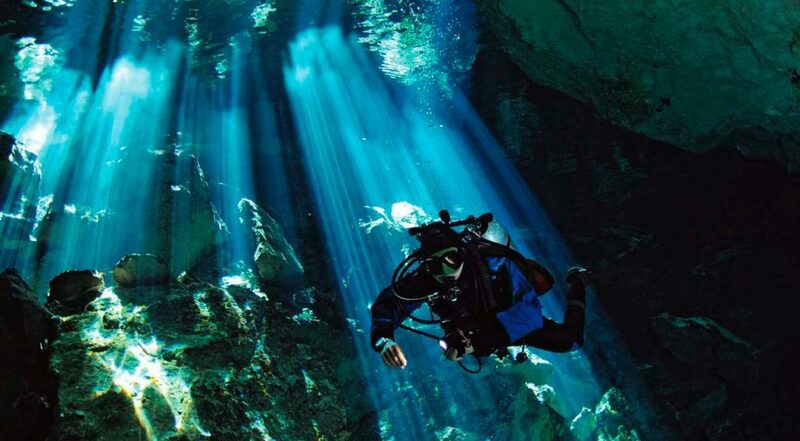 Kukulcan Cenote – Two dives are possible here with two unique experiences. Enjoy an amazing curtain of light, only visible in the morning, and a strong halocline effects which have been likened to diving into jelly! The second dive includes an awe-inspiring collapsed dome and plenty of stalagmites, stalagmites, and columns. Angelita – A cenote everyone is raving about because it is not like anything else out there. You are only diving in open water but is famous because of a thick hydrogen sulfide layer at around 30 meters formed from rotting vegetation. 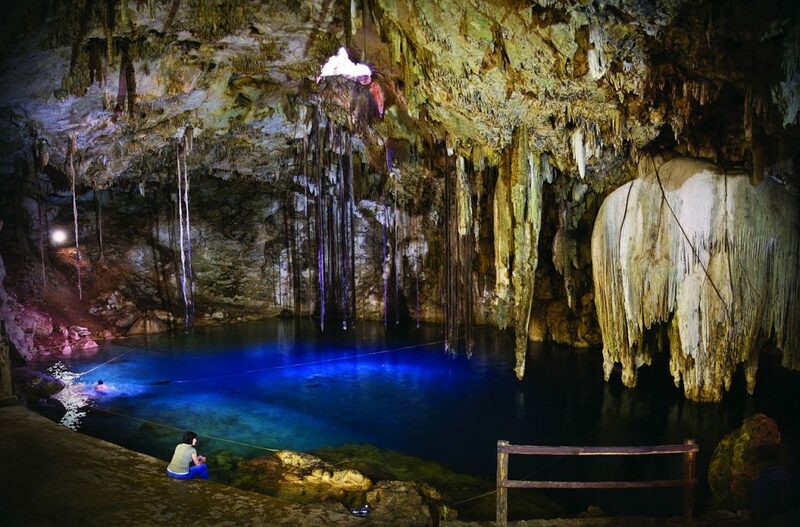 Hard to describe, it is something out-of-this-world and top of any cenote divers bucket list! 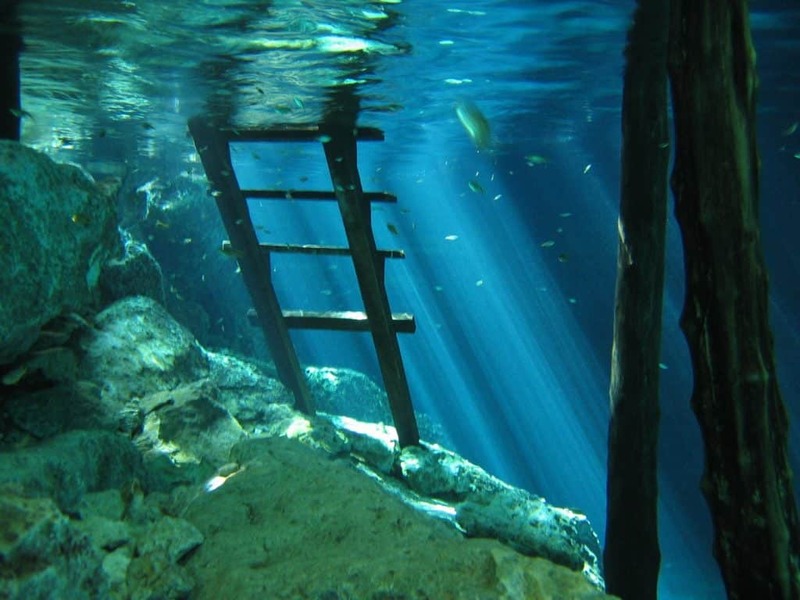 Dreamgate Cenote – One of Tulum’s most famous cenote dives offering two dives in one. Short but sweet. Experience the sensation of flying with a rooftop completely covered in stalactites you’ll be amazed they haven’t all fallen off. Another for those with excellent buoyancy control. Tankah Cenote – Located in the middle of a mangrove swamp and connected to one of the longest cave systems in Tulum, this is one unique dive. Due to it’s proximity to the ocean both fresh and saltwater fish residue here and you get the unique feeling of diving in a jungle as well as to see the halocline and its incredible light effects. With plenty of room, this is a great one for beginners. Pet Cemetery Cenote – Another stunning cenote hidden in the dense jungle. Many animal skeletons have been found here, thus the name, including a fossilized camel of all things! 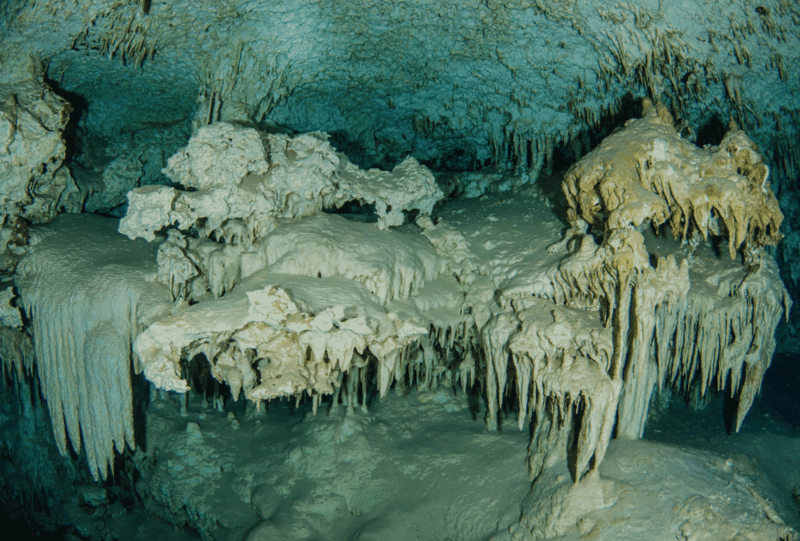 Also, one of the most ornate cenotes with white stalactites, stalagmites, and columns dripping from surfaces – This is one cenote dive which requires excellence buoyancy. The Pit Cenote – The deepest cenote in Tulum at 119 meters of 391 feet (and also the deepest cenote in Quintana Roo). An awe-inspiring sight of a seek-hole deep within the jungle. Has an outstanding hydrogen sulfate cloud and black lined record levels of water during the ice ages! Gran Cenote – The Gran Cenote is very close to Tulum and forms the heart of the Sac Aktun system, or ‘white caves’ – and the name is definitely well deserved. A collapse has also made this a dive with plenty of space and natural light so you could be forgiven for thinking you were in a palace more than the Mayan underworld. Cenote diving in Tulum does not require you to have special cave diving certification because you are technically not entering the cave, but a cavern with natural light and a close-by escape route. 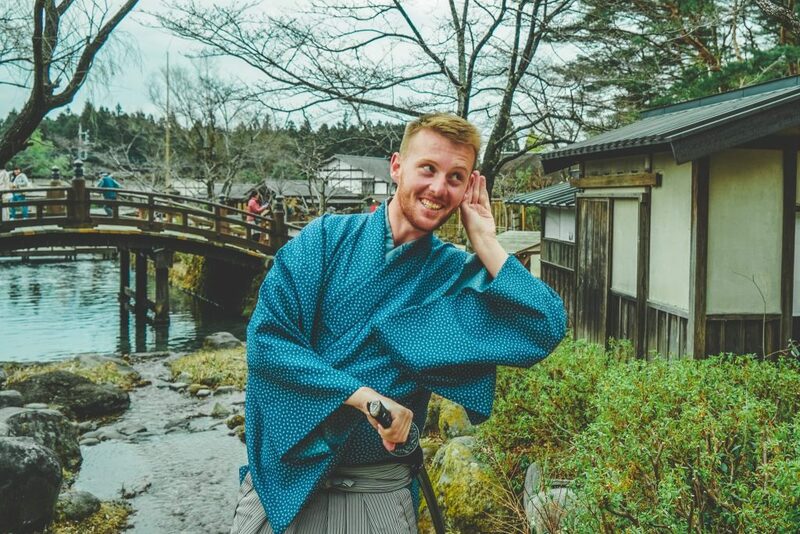 Safety, however, is still paramount so it pays to explore this natural wonders of the world with a reputable operator! Given the recent tourist boom in previously sleepy Tulum, it’s no wonder many, many dive shops have pop’d up to cater for demand – but as every scuba diver knows, quality is king and it always pays to go with the best. 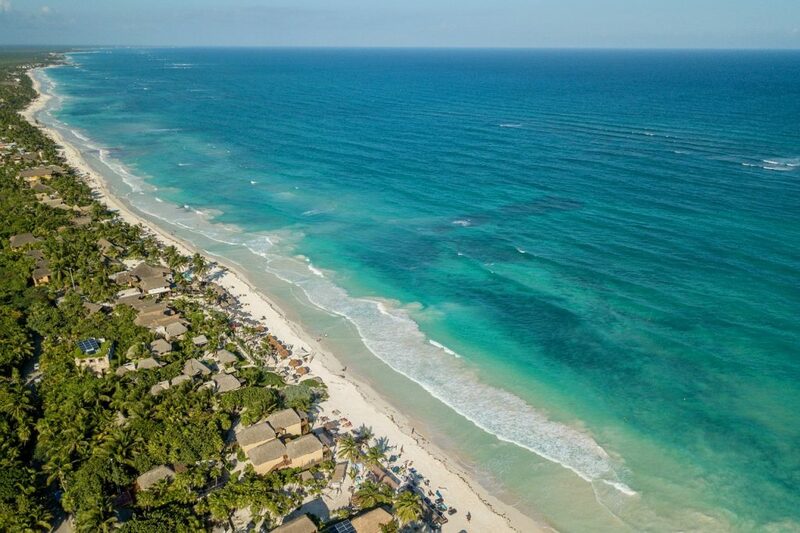 This is why after extensive research I opted for a trip with MexiDivers Tulum due to their long and stellar service record, passionate staff, family run operation, and location: beachside on the edge of the Tulum Hotel Zone. They are also the only dive shop in Tulum with their own boat to explore the reefs off Tulum (part of the second largest barrier reef system in the world!) if you fancy a bit of fresh and salty! 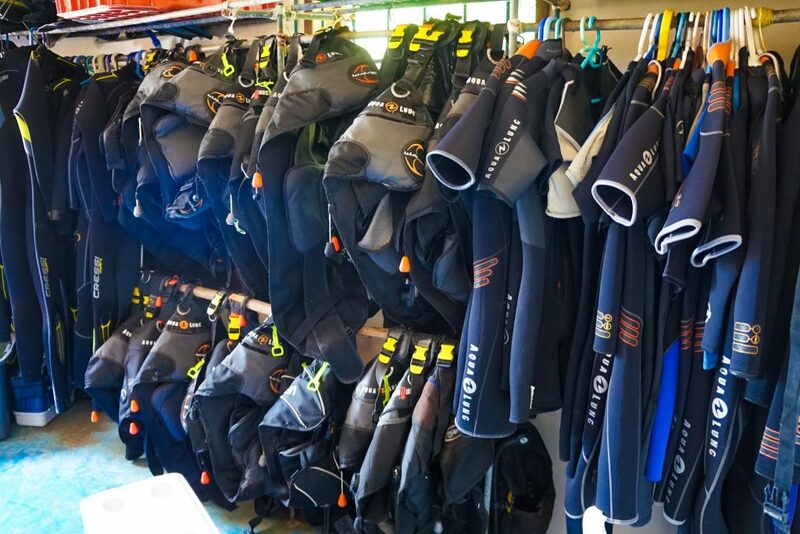 MexiDivers has a fully an equipt Tulum dive shop with new gear and well-looked after equipment that made getting in and getting decked out a breeze. Their guides were all very friendly, passionate and knowledgeable about what they were doing and Carlos, the shop’s owner, ensures thorough rigorous training and checks are carried out so that each and everyone of this guides is of an exceptional level. For my dives in Dos Ojos I had Joe, a guide with 17 years experience diving int the ocean and cenotes and from the moment I meet him, I felt calm and confident. He clearly explained the rules and concepts to me at the dive site beforehand, gave a thorough briefing and in the water was an absolute pro -knowing the best way of entry, dive position, even how to light photos (but sadly even he couldn’t save me from my GoPro’s bad lighting settings!). Bottled water was provided for after the dives, as was a high-quality underwater flashlight so you do not need to worry about bringing your own. A new air-conditioned van was used to take us to the dive sights – and, unlike many other unscrupulous operators in town, all taxes, entrance fees, gear rental etc was included in the one-off fixed price. Mexidivers is affiliated with PADI, SDI, and TDI so you are also able to undertake your open water and advanced courses in this diving mecca. Learning to scuba dive in Tulum is a great idea as you are given the ability to undertake incredible fresh and salt water dives, and to take classes right opposite the beach with the cool breeze blowing rather than being stuck in the main town like all the other dive shops! While I did not have time on my trip to explore the Tulum Reef, I did go a bit further down the coast in Belize and the visibility and coral structures were out of this world. Truly world class diving – so if you have the time talk to Carlos about a package deal with a mix of both! If you are short on time MexiDivers also runs like a fine-tuned machine so its Tulum cenote diving tours really only take half a day allowing for another activity in the morning or afternoon – perfect if you only on a brief long weekend in Tulum from the United States. 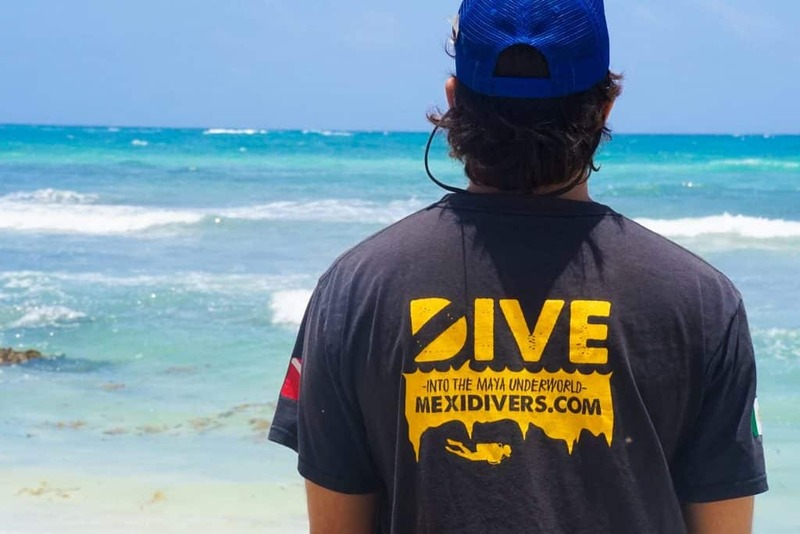 MexiDivers Tulum offer’s some of the best scuba diving in Tulum and with a decade of experience both in the cenotes and out at sea you will be sure of a safe, and utterly unforgettable adventure. 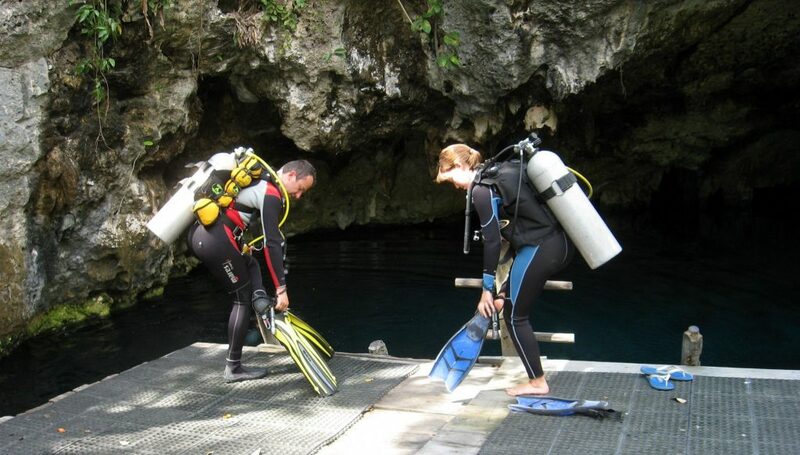 Honest and reliable, with a track record of great customer reviews and safety MexiDivers is my recommendation for scuba diving in the Tulum Cenotes. If you have any questions give them an email today! While you are in the area, don’t miss all these other fun things to do in Tulum, or consider heading up the coast with a fun Mexico whale shark tour. 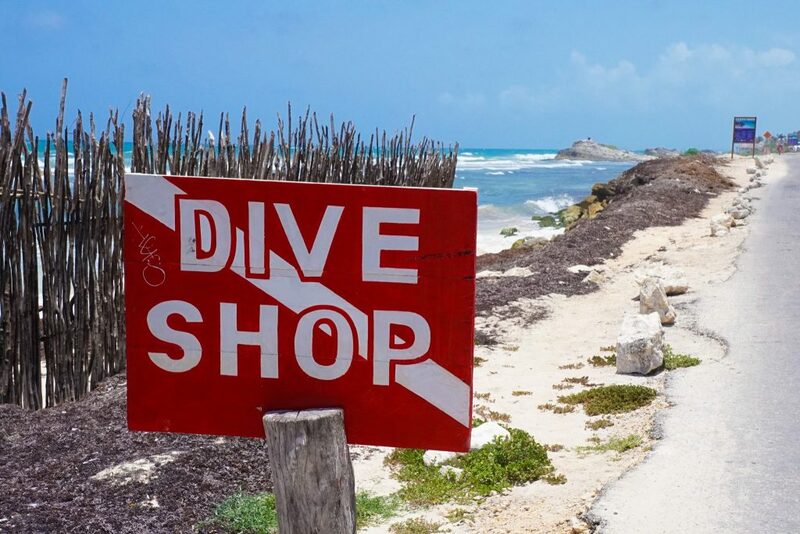 Or, don’t…and just spend every day scuba diving in Tulum.